The first date of the Northern Late Model Racing Association's 20th season of racing has been announced. The series will head to the Greenbush Race Park in Greenbush, MN on June 24th, 2017. The race would be the 25th for the series at the high banked three-tenths mile oval. The NLRA visited Greenbush twice in 2016. Cole Schill won his first NLRA series feature during the first event on June 18th. 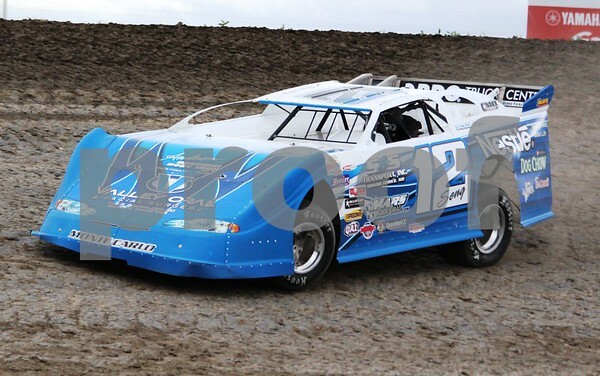 Brad Seng won the second visit on July 30th. The Greenbush Race Park has been a regular stop on the NLRA tour. Greenbush was one of three tracks featured in the four race inaugural season for the tour in 1998. Tom Corcoran won the inaugural event at Greenbush that season. Defending NLRA champion Brad Seng and the rest of the NLRA series regulars will embark on a 21 race schedule as the travelling series begins its' 18th season on Memorial Day weekend at the Viking Speedway in Alexandria, MN. To see the full schedule click here. Photo courtesy of Rick Rea. 1. Sat. May 18th, 7pm, Devils Lake Speedway, Devils Lake, ND. 2. Sat. May 25th, 6pm, Viking Speedway, Alexandria, Mn. 3. Sun. May 26th, 6pm, Viking Speedway, Alexandria, Mn. 4. Weds. June 19th, 7pm, Norman County Raceway, Ada, Mn.